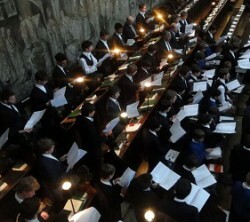 Under Edward Higginbottom’s leadership, the Choir of New College Oxford has gained a worldwide reputation and is known particularly for its stylish performances of Renaissance and Baroque music. Despite this high musical profile, with many recording commitments and a full programme of concerts in this country, on the continent of Europe and further afield, it is still recognisably what New College’s founder, William of Wykeham, envisaged in the fourteenth century: a choir of sixteen choristers and clerks whose duty was, and still is, to provide a sung liturgy in one of the grandest chapels to be built in Oxford. The Choir has appeared a number of times at the BBC Proms, and in recent years has performed to audiences in Australia, Brazil, Japan, the Low Countries, France, Germany, Poland and the Czech Republic. 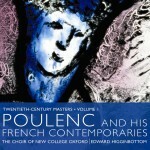 Recordings (over 70 CDs currently available) range from specialist collections (such as the compilation of sacred music drawn uniquely from the Archives of Malta Cathedral) to anthologies of choral music (such as Agnus Dei, which has sold over 300,000 copies worldwide). The Choir collaborated with The King’s Consort in its recordings of Handel oratorios and the complete sacred music of Henry Purcell. Another facet of the Choir’s recording activities is its series of five a cappella Renaissance Masterpieces CDs featuring some of the great polyphonists of the 16th century. 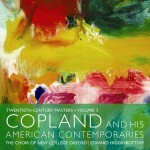 The Choir has released three CDs on Avie called the Twentieth-century Masters series: Copland and his American contemporaries featuring American choral music written in the last 50 or so years including Stravinsky’s Mass for choir and double wind quintet; Poulenc and his French contemporaries, including Poulenc’s Mass in G, and works by Messiaen and Villette; and MacMillan and his British contemporaries, consisting of music composed in the last 40 years or so including works by John Joubert, Tarik O’Regan and Ryan Wigglesworth which were written for the Choir and were first performed in New College chapel. 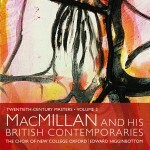 The series was recorded as a result of the Choir’s recent exploration of 20th-century choral music.